Been there, done that. : What's for Dinner Mom? 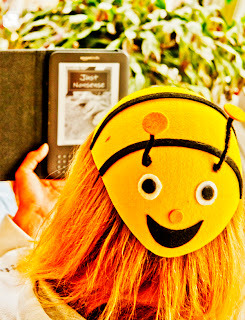 The week-end is here already and as you can see I am very busy reading my kindle. So if you ask me what is for dinner you are bound to be disappointed.. Mom is staying out of the kitchen today so make yourself a sandwich. That's right, I don't make dinner everyday. Tonight I am going to a summer concert to listen to my husband sing. No he is not in a band, although that would be cool. He sings in a choir. Mr tough guy, body guard, fireman also known to many as "Saw-man" sings in a choir during his free time. Maybe I will get lucky and get some of this on video, so if there is no video here now come back later for some entertainment. In the mean time enjoy your week-end! Tell me, what are you having for dinner tonight? Do you go out to eat a lot? Do you always make dinner? Do you wish you had a hat like mine? Labels: just nonsense, melynda fluery, What's for Dinner Mom? Most nights I end up cooking dinner twice - once for the kids and once for my husband - he's worked for west coast companies for the last several years, and often is in his office until 8 EST - too late on a school night for the kids. Did I mention I hate to cook? Your hat is silly fun! We eat out maybe once a week? Otherwise my wife and I share meal-making duties. I have a lovely hubby who will cook some nights. My mother has just called in after having been to the fishmongers and she's brought us some lovely, large fresh scallops. So the menu tonight: fresh scallops lightly sauted with new season asparagus only picked and in the farm shop this morning. I'd love a hat like yours. Where did you get it at? Cooking: I cook Saturdays, Sundays, Tuesdays and Wednesdays. The rest of the time is for leftovers or may we'll go out to eat. But I prefer home cooked versus retaraunt food any day. Tonight: I will be loppity-loppin, curly-curly-curling, and coloring hair. Workity-work-work-work. i love to cook---but sometimes cooking is more expensive than just picking something up--so i have started buying cheaper stuff and preparing it at home--but it's not really cooking haha--like rice dishes or mac and cheese or instant potatoes with a frozen veg. steamer bag and then frozen fish or chicken pieces---tmi--i know--but thank you for asking, as i love to talk about what i make for dinner---i do love your hat!!! I'm the one asking what's for dinner! Dinner tonight is chicken curry - the OH has flown off the England leaving me with half a chicken to finish up on my own. Loved the video! Which man was he? Drunken Sailor--I used to sing that as a lullaby to my babies. We are having fish tonight! That's the perfect reading hat... cheerful & summery! Thanks for the entertainment! The choir is lovely and they did an awesome job with the drunken sailor! Last night we didn't cook either - it was boxing night, so just hors d’oeuvre and beer. Tonight is my turn to cook so there will be chicken breast, dill potatoes and tomato salad. Hi Siv .. that was great - the mobile phone did its video thing .. wonderful to hear - and it was in a language I understand!! Though there was a touch of Norwegian accent ..
Great - and well done for having a family that can look after itself .. while Mum goes out .. Eye Spy "End of Days"